Ms. Heck spoke during the council meeting concerning clean up of new dumping at the former West End Recycling. Huntington City Council has approved homeland security grant expenditures that provide body armor and other equipment for the Huntington Police Department and security for the Big Sandy Superstore Arena. Council approved contracts for body armor, body armor plates and SWAT helmets. Captain Underwood told council that the contracts cover 20 units each. The SWAT helmets contain tactical, attached communications gear (rather than the microphone on the shoulder). The grant money covers the SWAT team. Captain Hank Dial indicated that a "private donor" had paid for helmets and gear for other officers, so that all members would be protected. Amounts approved are $49,645.20 for body armor, $16,410 for body armor plates; and $29,763.60 for helmets. Rik Edgar, general manager of the Big Sandy Superstore Arena, explained that $44,729.12 would be spent for walk through metal detection and $38,350.42 for a crowd control barrier at the stage. All funding comes from the West Virginia Division of Homeland Security and Emergency Management and the U.S Department of Homeland Security. The city does not have to match any portion. Council had to approve the individual contracts since they are for more than $15,000. Cathy Moore, interim finance director (replacing Pam Chandler) , explained that the approved budget revision shifts monies from state and federal line items. During Good and Welfare, Stephanie Heck discussed illegal dumping of thousands of tons of debris ( tires, garbage, used motor oil) at the former West End Recycling location between Jefferson and Madison Avenue near the Speedway convenience store. Ms. Heck had sent photos of the debris on social media. Huntington officials were on the scene Monday, Nov. 27 to work on abatement strategies. The WV Department of Environmental Protection is expected to issue citations. When city officials responded, according to a Herald Dispatch report, "puddles" of oil filled a sixty foot section of a Jefferson Avenue gutter. 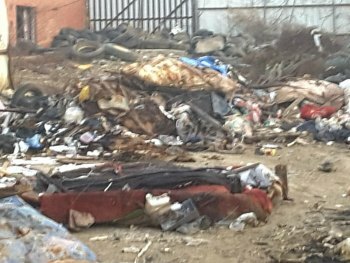 Heck at the council meeting suggested that the city designate an "environmental officer" as the illegal dumping violates civil and criminal statutes. The closure of West End Recycling , which had accepted stolen copper for recycling, has in Heck's words "reduced drug traffic" in that area as no one will now purchase copper. William Smith, the former owner, was convicted in 2016 and accepted a plea deal for engaging in a criminal enterprise and selling stolen copper. The gates of the disposal site were found unlocked during the weekend.